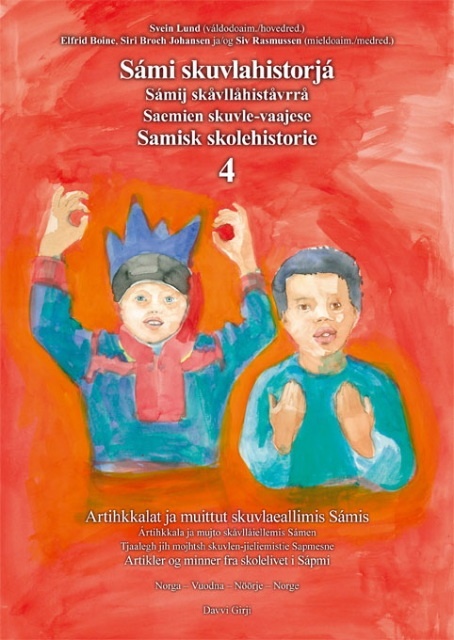 Many have experienced that the teaching in school did not have any Sami content. But there are exceptions. 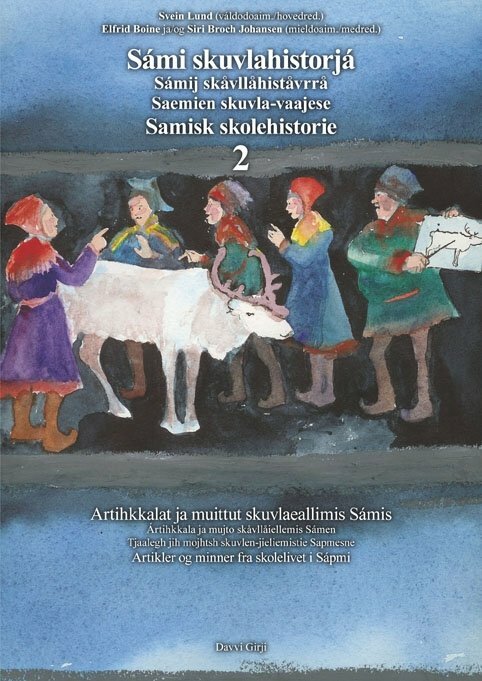 Here are some examples that Sami culture has been taught in the school, and former pupils often tell that this teaching has been of great importance to them. Inger Marie Sokki Hætta is among those who did not learn much in school due to the norwegianization politics and the war. 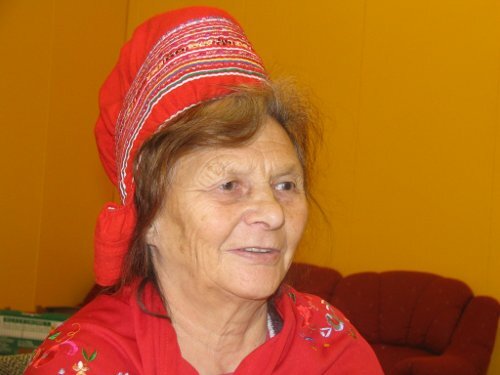 She went to school in Guovdageaidnu from 1947 and tells that she did not learn anything from the theoretical subjects, which all were taught in Norwegian. The only things I learned was when we had duodji, or «needlecraft» as it was called back then. Because those lessons Edel taught in Sami. We learned to weave bands for fur shoes, knit woollen socks and mittens and to crochet "speallavearkka" (the edge of the traditional Sami female cap). It has been very useful to me, later I have been weaving and knitting items for sale. At home I had learned to sew national costumes and to work with fur from my mother, but I learned weaving and knitting in school. And it is really the only things I learned in that school. This piece is a part of the booklet "Joatkaskuvla - Framhaldsskolen", which Lydolf Lind Meløy wrote in 1956. At the time he was the leader of Inner Finnmark school council, and later became superintendent of schools. In needlecraft and woodwork one has better conditions than in any other subjects to integrate what is characteristic for the Sami people. 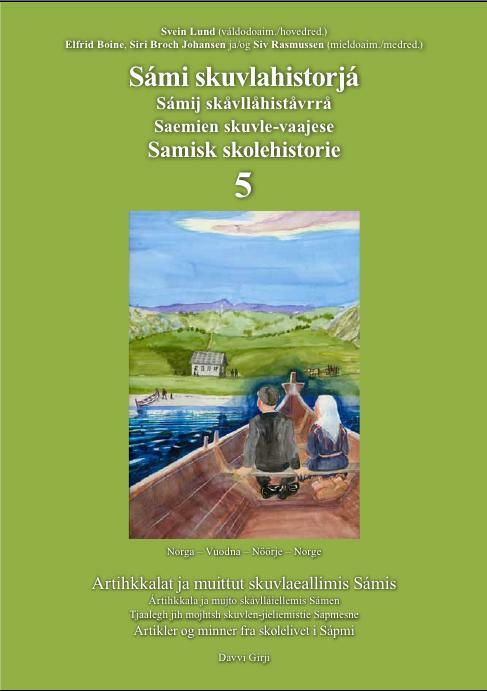 This goes in particular for the Sami nomad secondary school. Naturally the girls have to learn regular needlecraft. That applies both to sewing and knitting of ordinary things, but the Sami needlecraft comes in addition to this. Plaiting of bands can be taught already in primary school, and in secondary school it is suitable to start with sewing of caps and fraying of scarves. To get started with sewing of national costumes will probably be too big and difficult a task. The same could maybe also be said about sewing of furred shoes, but some work with fur should be taught, if nothing else then patching of furred shoes. The pupils also need to learn weaving of belts and drawing of Sami patterns. In woodwork the pupils are working with wood, as they do in the rest of the country. For everyone – and in particular for the Sami nomad pupils – it is emphasised to learn how to use the knife. The Sami nomads will have great use and delight from items made from birch, for instance wooden cups and plates. Pupils in the secondary school are able to make more advanced things, such as hames, and many will probably also be able to make their own pulka or sleigh. In addition to this comes horn- and bone craft, where the pupil for instance should get the possibility to make knife handles, paper knives and belt buckles. When it comes to all woodwork and needlecraft, there will be put great emphasis to make things the pupils or their homes need, or things they will have pleasure and delight from. Therefore all pupils do not get to make the same items, but are allowed to choose between different items. It is still important that every pupil gets to carry out all kinds of techniques that are to be learned. We made a lot of things in reindeer horn. We bought the horns directly from the owners of the reindeers. Horns were not so expensive as they have become later. I was very interested in this, but did not know so much when I arrived. We got to borrow models which we tried to copy and many of the pupils already had experience in horn crafts. In particular I remember two of my pupils who made very beautiful things already back then, and who later became known as very good craftsmen – Johan Rist and Heaika Buljo. Every now and then Lauri Keskitalo helped me, he was the state consultant in Sami arts and crafts back then. 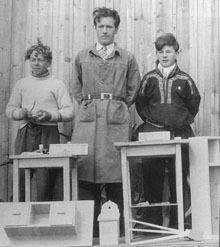 Olav Malin with the pupils Henrik Henriksen Buljo and Isak Isaksen Triumf in the carpentry workshop 1951. Anita Lervoll did her first years of primary school in the 1980's in Manndalen in Kåfjord. The first 6 years we had a teacher who came from the village. 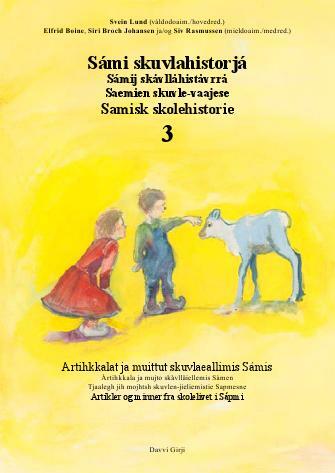 When I think back at the school time and the teacher we had, I can clearly see that he had made a clear choice of value concerning what was Sami, also in how he used it in his teaching. In his teaching he used several local stories, which made us get to know and get attached to the village in a curious, positive and safe way. Through ghosts and stories about "huldra" (a mischievous wood nymph) we got to know a part of the history of the village. The teacher could tell us who had seen "huldra", and he also knew who in the class was related to this person, and furthermore also exactly the place where "huldra" had been seen. He could also tell us what we should do if we met "huldra", so we did not have to be afraid in a possible meeting. He also encouraged us to tell stories. We had regular narrating hours where every single pupil had to tell a story or sing a song in front of the rest of the class. Some of us told stories we had heard at home, and in that way the entire class got to take part in the local history of the village, and at the same time the tradition of storytelling was kept up. Because of this teacher I know a lot today that I can pass on to my children and others who would like to listen. 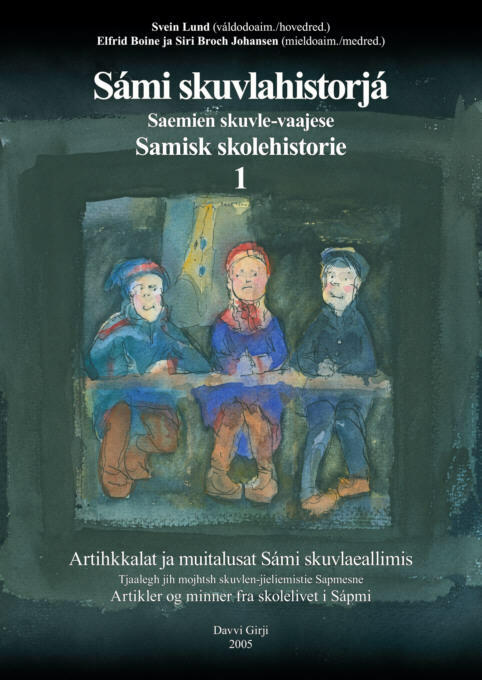 He also taught us some words and expressions in Sami, among other things we got to know that Manndalen originally was called Olmmáivággi. The class thought this was so cool that we wrote a letter to the municipality asking to change the name of Manndalen to Olmmáivággi. I do not remember if it was a unanimous majority for the decision in the class, but I do not think we got any reply from the municipality. In a school system which was based on foundations and general plans from a Norwegian world, fortunately our teacher was engaged in passing on our cultural history in a positive way, which made us feel closer to the village and also to each other. 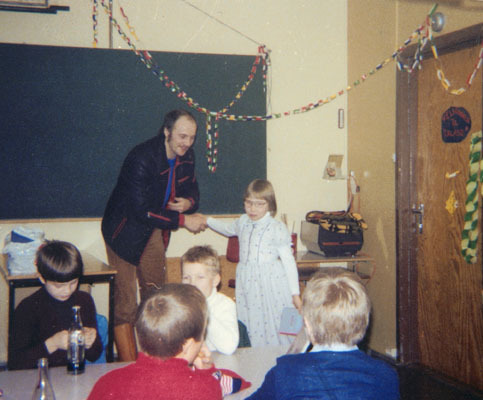 Anita Lervoll is given an evaluation book from the teacher, Manndalen school. Then you could ask, what if we would have had another teacher, someone who was not interested in passing on other local knowledge than what was required from the curriculum? It is frightening to think about how one is so dependant of the right people to get this kind of knowledge! It also shows that when you are living somewhere in between different normative approaches, kind of attachment which is seen as the best one for you is actually left to the choices of others. It means that my school, still in the 80's, was in between the close and the distant choices of value. My teacher chose the close values, and therefore I got to take part in them. He could have chosen the distant ones, with the result that I would have known more about Oslo than about my own village. Through the teacher we were given a language which bound together the small, everyday stories of values with a language which had potential to create identity! The use of only Norwegian language vocabulary, or Norwegian stories, would not have carried the seed to my Sami identity in the same including way.